This week's prize is a copy of Duran Duran's newest CD, Astronaut. To enter to win, send an e-mail to bluestatedc @ gmail.com with "Duran Duran" in the subject line by 11:59 p.m. on Wednesday, May 4, 2005. We'll notify the winner on Thursday. Good luck! You know her, you love her, you’ve seen her at Fort Reno. This week, bluestate is giving away not just one, but FIVE copies of Mary Timony’s latest release, Ex Hex, which just came out on April 19 on Lookout! Records. Each winner also gets a Mary Timony poster. So, what are you waiting for? To enter to win Ex Hex, send an e-mail to bluestatedc @ gmail.com with “Ex Hex” in the subject line by 11:59 p.m. on Wednesday, April 27. We’ll notify the winners on Thursday. Good luck! In the meantime, download “Friend to J.C.” here. Lady Sovereign, "Random [vocal mix]"
Le Tigre, "Deceptacon [DFA mix]"
Cmilckar & Chocolate, "Som de Preto"
Joy Division, "No Love Lost"
Pixeltan, "Get Up, Say What"
The Rapture, "House of Jealous Lovers [skipping vinyl mix]"
Maximo Park, "Postcard of a Painting"
Mylo, "Destroy Rock N' Roll"
Prince, "I Would Die 4 U / Baby I'm A Star"
The Police, "De Do Do Do, De DaDaDa"
Franz Ferdinand, "This Fire (Playgroup Remix)"
Thunderbirds Are Now! "198090 (Aquatic Cupids)"
VHS Or Beta, "The Melting Moon"
Tribeca, "La, La, La Etc"
Gwen Stefani, "What You Waiting For?" The Star Spangles, "Which One Of The Two Of Us Is Gonna Burn This House Down?" The Ramones, "I Don't Wanna Grow Up"
Hot Hot Heat, "Pickin' It Up"
Go-Gos, "We Got the Beat"
Duran Duran, "Hungry Like the Wolf"
This week, we’re giving away a copy of The Sights' self-titled album, released this week on New Line Records, courtesy of Filter. Detroit’s The Sights play blues-tinged, catchy garage rock, with a retro vibe, of course. To enter to win The Sights, send an e-mail to bluestatedc @ gmail.com with "The Sights" in the subject line by 11:59 p.m. on Wednesday, April 20, 2005. We'll notify the winner on Thursday. Good luck! And, don't forget to enter our NYC contest! Brazilian Girls in NYC -- for free! We here at Bluestate think everyone who comes to our gigs, reads our website or enters our contests is a winner. Really, we love you guys. But some winners are bigger than others. Bluestate and Verve Music Group are giving away a Grand Prize trip to New York City (not on a Chinatown bus, we promise) to see Brazilian Girls (the band, not just ladies from the country). First Place winners get an iPod Shuffle and the first 5,000 nationwide entrants get a sampler CD. So go ahead, let your inner winner shine and sign up! bluestate is certainly looking forward to Dizzee Rascal’s return to the District. Half of bluestate caught his show last time he was in town, opening for The Streets, and although we couldn’t always understand what he was saying, we were quite impressed nonetheless. So, to get you excited for Dizzee’s April 25 headling gig at the 9:30 Club, we’re giving away his latest CD, Showtime, along with a Showtime T-shirt (black, XL), courtesy of XL Recordings. To enter to win, send an e-mail to bluestatedc @ gmail.com with "Showtime" in the subject line by 11:59 p.m. on Wednesday, April 13, 2005. We'll notify the winner on Thursday. Good luck! Congratulations to Thatchmaster E. (currently in D.C. but generally a blue at home in mountainous red-state land), who won The National's Alligator, and thank you to everyone who entered! This week, we're giving away a copy of The National’s Alligator, due out April 12 on Beggars Banquet Records. Rolling Stone describes the band's sound as “Leonard Cohen-meets-Joy Division.” This bluestater has been listening to it all afternoon. 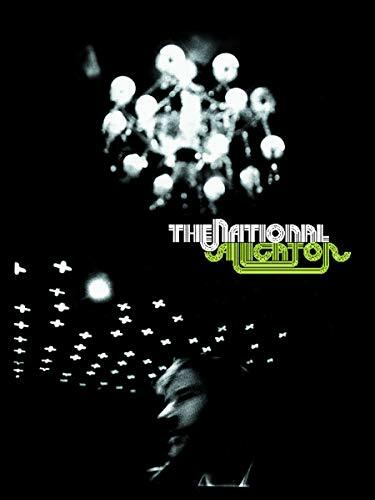 To enter to win Alligator before you can get it in stores, send an e-mail to bluestatedc @ gmail.com with "The National" in the subject line by 11:59 p.m. on Wednesday, April 6, 2005. We'll notify the winner on Thursday. Good luck!